Place the cod loin fillet in coarse salt for 20 min to firm up the flesh, then desalt under a stream of cold water for 10 min. Mix the morels, roll the fish pieces in them, and wrap in plastic film. Steam cook for around 6 min. Leave to rest for 6 min. Remove the peduncle from the endives, and cook in the water with 10 g of butter, salt and sugar for 10 min, simmering. Cut the onions into a fine brunoise, sweat with 10 g butter over low heat, add the ground walnuts and the diced comté. Stuff the endives with this stuffing, then roast them with the remaining butter. Place the egg yolks in a saucepan with the macvin, and whisk the sabayon in a bain-marie. Once the sabayon is cooked, add the oils and 10 g of butter. Adjust seasoning. Cut the spring onions finely, and sweat in the butter. Add the pre-washed morels, caramelise the whole thing, then pour on the meat juice. Cook with a lid on for 35 min. Once cooked, grind the resulting stew. 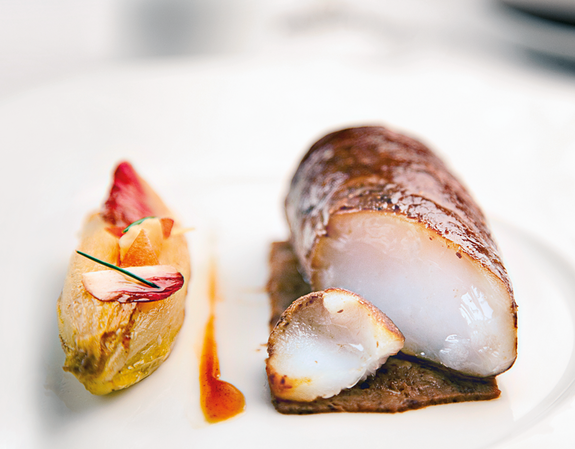 Place the piece of cod on top of the morel marmalade, with the two endives next to it. Finish by pouring a little fish juice with vinegar onto the endives.